Micropitting, pitting and wear are typical gear failure modes that can occur on the flanks of slowly operated and highly stressed internal gears. However, the calculation methods for the flank load-carrying capacity have mainly been established on the basis of experimental investigations of external gears. This paper describes the design and functionality of the newly developed test rigs for internal gears and shows basic results of the theoretical studies. It furthermore presents basic examples of experimental test results. This method of testing large gearboxes or, indeed, any power transmission element, had numerous advantages and offers the possibility of large savings in time, energy, and plant, if the overall situation is conducive to its use. This usually requires that several such units need to be tested, and that they can be conveniently connected to each to each other in such a way as to form a closed-loop drive train. No power sink is required, and the drive input system has only to make up power losses. The level of circulating power is controlled by the torque, which is applied statically during rotation, and the drive speed. Principles, advantage, and limitations are described, together with recent experiences in the only known large-scale usage of this technique in Australia. This paper seeks to compare the data generated from test rig shaft encoders and torque transducers when using steel-steel, steel-plastic and plastic-plastic gear combinations in order to understand the differences in performance of steel and plastic gears. On gear drives running with pitch line velocities below 0.5 m/s so called slow speed wear is often observed. To solve some problems, extensive laboratory test work was started 10 years ago. A total of circ. 300,000 h running time on FZG back-to-back test rigs have been run in this speed range. When manufacturing powder metal (PM) gears lead crowning is not achievable in the compaction process. This has to be accomplished either by shaving, grinding or honing. Each of these processes has their merits and draw backs. When employing rolling using a roll burnishing machine lead crowning can be accomplished but due to errors in profile a hard finishing operation such as grinding is used by the industry. In this paper a helical PM gear that has sufficient tolerance class after rolling has been tested in a test rig for durability and the wear has been studied. The purpose of this paper was to verify, when using an oil debris sensor, that accumulated mass predicts gear pitting damage and to identify a method to set threshold limits for damaged gears. This back-to-basics article describes the main methods used for hardness testing of gears: Rockwell, Brinell, Vickers and Knoop. Background on the development of a high-speed, automatic hardness tester for gear steels. An accurate and fast calculation method is developed to determine the value of a trigonometric function if the value of another trigonometric function is given. Some examples of conversion procedures for well-known functions in gear geometry are presented, with data for accuracy and computing time. For the development of such procedures the complete text of a computer program is included. 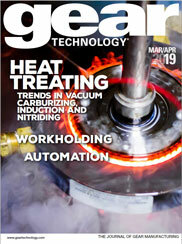 In this special section, our editors have gathered recent news and information related to the heat treatment of gears. Here you’ll find a comprehensive assortment of news and upcoming events that will help you understand the various heat treatment processes available for gears and choose the best option for your projects, whether you heat treat in-house or send your gears to a commercial heat treating provider. New GRSL technology adds value to high-volume transmission gear inspection by combining non-contact laser inspection with tried-and-true composite roll testing. In recent years, gear inspection requirements have changed considerably, but inspection methods have barely kept pace. The gap is especially noticeable in bevel gears, whose geometry has always made testing them a complicated, expensive and time-consuming process. Present roll test methods for determining flank form and quality of gear sets are hardly applicable to bevel gears at all, and the time, expense and sophistication required for coordinate measurement has limited its use to gear development, with only sampling occurring during production. Part I of this paper describes the theory behind double-flank composite inspection, detailing the apparatus used, the various measurements that can be achieved using it, the calculations involved and their interpretation. Part II, which will appear in the next issue, includes a discussion of the practical application of double-flank composite inspection, especially for large-volume operations. Part II covers statistical techniques that can be used in conjunction with double-flank composite inspection, as well as an in-depth analysis of gage R&R for this technique. Gear flank breakage can be observed on edge zone-hardened gears. It occurs, for example, on bevel gears for water turbines, on spur gears for wind energy converters and on single- and double-helical gears for other industrial applications. This paper presents the results of research directed at measuring the total stress in a pair of statically loaded and carburized spur gears. Measurements were made to examine the change in total stress as a function of externally applied load and depth below the surface. This paper presents the results of a study performed to measure the change in residual stress that results from the finish grinding of carburized gears. Residual stresses were measured in five gears using the x-ray diffraction equipment in the Large Specimen Residual Stress Facility at Oak Ridge National Laboratory. An experimental effort has been conducted on an aerospace-quality helical gear train to investigate the thermal behavior of the gear system as many important operational conditions were varied. Gear specialists at the NASA Glenn Research facility helped determine it was safe for the space shuttle to fly again. A single tooth bending (STB) test procedure has been developed to optimally map gear design parameters. Also, a test program on case-carburized, aerospace standard gears has been conceived and performed in order to appreciate the influence of various technological parameters on fatigue resistance and to draw the curve shape up to the gigacycle region. Bringing new or improved products to market sooner has long been proven profitable for companies. One way to help shorten the time-to-market is to accelerate validation testing. That is, shorten the test time required to validate a new or improved product. Presumably, everyone who would be interested in this subject is already somewhat familiar with testing of gears by traditional means. Three types of gear inspection are in common use: 1) measurement of gear elements and relationships, 2) tooth contact pattern checks and 3) rolling composite checks. Single Flank testing falls into this last category, as does the more familiar Double Flank test. Runout is a troublemaker! Good shop practice for the manufacture or inspection of gears requires the control of runout. Runout is a characteristic of gear quality that results in an effective center distance variation. As long as the runout doesn't cause loss of backlash, it won't hurt the function of the gear, which is to transmit smooth motion under load from one shaft to another. However, runout does result in accumulated pitch variation, and this causes non-uniform motion, which does affect the function of the gears. Runout is a radial phenomenon, while accumulated pitch variation is a tangential characteristic that causes transmission error. Gears function tangentially. It is also possible to have a gear with accumulated pitch variation, but little or no runout. Question: What is functional measurement and what is the best method for getting truthful answers? The concept of "transmission error" is relatively new and stems from research work in the late 1950s by Gregory, Harris and Munro,(1) together with the need to check the accuracy of gear cutting machines. The corresponding commercial "single flank" testing equipment became available in the 1960s, but it was not until about ten years ago that it became generally used, and only recently has it been possible to test reliably at full load and full speed. A much-used method for checking the tooth thickness of an involute gear tooth is to measure the dimension over two balls placed in most nearly opposite spaces in the case of external gears, and the dimension between the balls in the case of internal gears. This measurement is then checked against a pre-calculated dimension to denote an acceptable part. Anyone involved in the design, manufacture and use of gears is concerned with three general characteristics relative to their application: noise, accuracy, and strength or surface durability. In the article, we will be dealing with probably the most aggravating of the group, gear noise. The most conclusive test of bevel and hypoid gears is their operation under normal running conditions in their final mountings. Testing not only maintains quality and uniformity during manufacture, but also determines if the gears will be satisfactory for their intended applications. Joe Arvin comments on his recent trip to Scandinavia and how U.S. defense dollars are being spent overseas. J.D. Smith responds to an article on gear noise from the previous issue. This section will deal with the use of gear inspection for diagnostic purposes rather than quality determination. The proper evaluation of various characteristics in the data can be useful for the solution of quality problems. It is important to sort out whether the problem is coming from the machine, tooling and/or cutters, blanks, etc. An article by Robert Moderow in the May/June 1985 issue of Gear Technology is very useful for this purpose. Napoleon Engineering Services specializes in Custom Bearing Manufacturing, Bearing Inspection and Bearing Testing. NES is AS9100C Certified and is your one stop stop for custom bearing product.